The hardest part about running your own ecommerce store is driving targeted traffic to your products. Unlike selling on marketplaces like Etsy, Ebay, and Amazon, you are responsible for finding your own customers. If you’ve only ever sold on a marketplace like Amazon, you probably have no idea how to launch a store because you don’t have the skills to advertise. After all, Amazon does most of the work for you and leaves you highly dependent on THEIR traffic. To create a strong ecommerce brand in the long run, you NEED to have your own web presence. You NEED to be in control of your own product messaging. You NEED to own your customer list. But what you probably don’t know is where to start when it comes to generating your own sales. Should you focus on content marketing? Should you run Facebook ads? Should you try Google Adwords? If you are starting from complete scratch, a quick way to jump start your ecommerce business is to use PPC advertising and in some cases, leveraging Google or Facebook by itself is sufficient to create a 7 figure business. But which one should you start with? After all, Google Adwords may not be a good fit for your products. Facebook advertising may not be either. It all depends on what you sell and the nature of your audience. 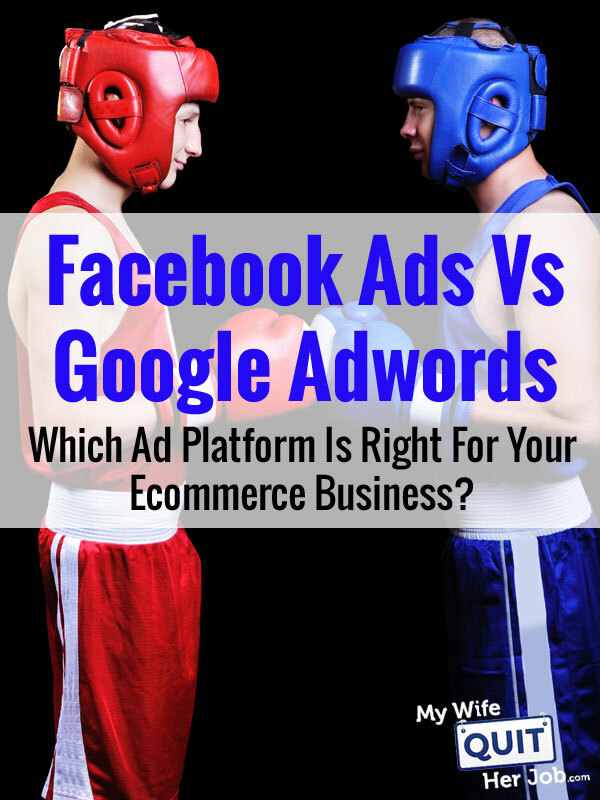 So today, I’m going to help you decide which ad platform (Facebook or Google) is right for you and where to begin. Note: This post only addresses advertising to cold prospects and does not apply to retargeting. In general, retargeting ads should be run on all advertising platforms because customers are already aware of your brand. Most people jump right into Facebook or Google advertising without a strong product and lose a ton of money in the process. Pay per click advertising is not a magic bullet for sales. If your site isn’t converting in general, then no amount of advertising is going to help. For example, if your products fall into any of the categories below, then you are going to have problems making sales no matter what! If your goods can be found at the local store, there’s very little reason for shoppers to buy from you. For example, if you run an ad for paper clips or post it notes, they will rarely convert unless you are way cheaper than the competition. People like to shop around and the average shopper will visit your site 4-8 times before making a purchase. If you are going up against established competition with no clear advantage, it will be hard to unseat an established brand unless you are much less expensive. Do you see a pattern above? Basically, your store needs to have a strong value proposition in order to make advertising work. The purpose of marketing is to spread the benefits of your products to the masses, not generate random clicks. So before you spend a single penny on ads, make sure your messaging is clear. Why should people buy from you and not the competition? Assuming you have a strong value proposition, let’s delve into the pros and cons of Google vs Facebook. In general, Google advertising works well when there is already existing awareness for the type of product you are selling. For example, I sell handkerchiefs in my store and believe it or not, thousands of people look to buy handkerchiefs every month. Before you spend a single penny on Google Adwords, you need to figure out whether there is search demand for your products. Think of all of the keyword terms people are typing in to find your products and see how many people are looking to buy. To conduct this type of research, I like to use a tool called Long Tail Pro. Not only does Long Tail Pro tell you how many searches your product is getting but it also tells you how competitive a keyword term is to rank on Google organically. However, you have to be careful and pay specific attention to search intent. Are people searching for your terms to do research or to buy? 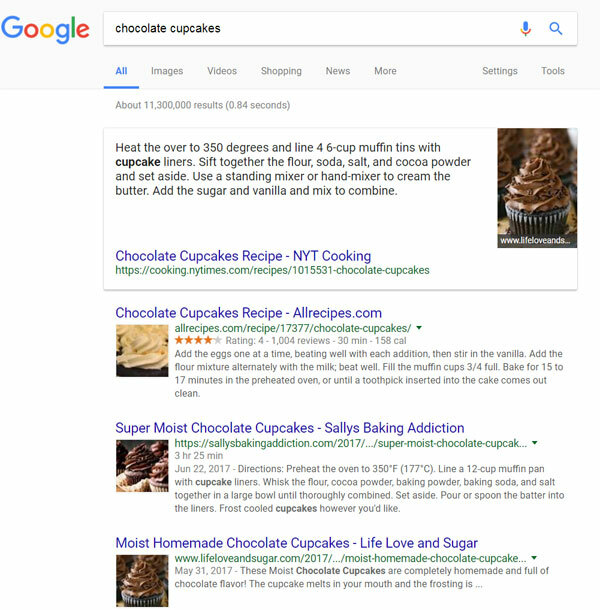 For example if I sell chocolate cupcakes, people searching for “chocolate cupcakes” might be looking for cupcake recipes instead of an online bakery. Here’s what a search for “chocolate cupcakes” brings up in Google. Every single entry is a cupcake recipe which is not a good thing if you’re trying to sell your own. In some cases, people searching for your targeted keyword terms might be looking for specific products that you don’t sell. For example in our store, people searching for the keywords “cloth napkins” are often looking to buy cheap polyester napkins which we don’t carry in our shop. In fact, only a small fraction of the searches for “cloth napkins” ever result in sales for our store. Now if these people searched for “polyester napkins” instead, I wouldn’t have this problem. But it can be difficult to read a customer’s mind and know what they are looking for based on what they type in. On the flip side, keywords like “wedding handkerchiefs” convert extremely well for our shop. It’s specific. There’s purchase intent and we know that people are looking for a well defined type of product. Overall, if people are searching for specific product based keywords that match what you sell, then Google will be a good fit for your shop. However, you need to use an Adwords keyword tool to find the right terms to target. Google Adwords is a poor choice if no one knows about your product at all. If you are introducing a revolutionary new concept that no one is actively looking for, it’s not going to work. Google is also not a good option if it’s difficult to narrow down highly focused keywords that result in sales. For example if you sell random gifts in your store, the keyword “gifts” is highly unlikely to convert because it’s impossible to tell your customer’s search intent. The word “gift” is too vague to be profitable unless you happen to carry an enormous, all encompassing collection of products. Sometimes, a customer search for a broad keyword might not behave as you expect. For example if everyone is searching for “linen napkins” with the intent to buy butterfly themed napkins that you don’t sell, then you’ll never make any sales. Overall, you need to consider all of these factors when formulating your ads. Facebook ads work extremely well when your target audience is well defined. If your best customers are enthusiasts and highly devoted to your product category, then Facebook is ideal. For example, if you sell a special bike helmet with built in cameras that act as rear view mirrors (i’m just making this up), then you can easily target cycling aficionados. Let’s say you sell a product that puts new born babies to sleep at your command (without using Benedryl), then you can target new parents with babies. Facebook ads are also extremely effective at conveying your unique value proposition within the ad itself. Unlike Google Search Ads which are limited to a few hundred characters, you can put together detailed videos and images on Facebook to actively sell your product. As a result, customers with zero awareness of your product might potentially buy when they see how awesome it is. Here’s an glimpse of a Facebook video ad that we’re planning on running over the holidays to sell our aprons. Now if we were to use Google text based search ads, it would be really difficult to run a profitable campaign because thousands of stores are targeting the “apron” keyword. But a well placed video ad to Moms might stir up some emotions and close the sale. One of the students in my Create A Profitable Online Store Course, Abby Walker, uses Facebook ads to generate over 100K per month selling high heel insoles on her site. The product clearly resonates with women and they are compelled to buy even if they weren’t looking for a solution in the first place! Bottom line, if you can create a convincing ad and landing page to a targeted audience, then you can literally get people to buy anything on Facebook. While Facebook ads can generate sales for most products, they tend to be unprofitable for certain classes of goods. If you sell products that are time sensitive, or useful under special circumstances, then it’s going to be harder to run profitable ads. For example, I recently tore my achilles tendon and was looking for a set of insoles for my ankle boot. Because Facebook has no way to target customers with achilles tendon ruptures(at least not yet), it’s impossible to isolate relevant customers. Sure you could blanket the Internet with achilles insole ads, but only a very small percentage of customers would apply. Note: You might be able to advertise these insoles to sports teams and doctors, but hopefully you get my point. If you are addressing a solution based on specific circumstances that can’t be targeted by Facebook, then it’s going to be tough to make money. In my case, I did a search on Google for achilles tendon insole and found what I was looking for right away. For this type of product, Google ads would have been a much better choice than Facebook. For certain businesses like my handkerchief shop, you can be successful with both Facebook and Google advertising. But for some businesses, only one platform may be effective. The best way to figure it out is to ask yourself a few basic questions. If you are introducing a brand new product category that no one knows about, Facebook is the way to go. If there is existing demand for your product and people are actively searching for it, then Google is a good fit. If your product is difficult to understand and requires explanation, then Facebook is a better advertising medium because you can explain your benefits in the ad itself. You can also give away informational lead magnets in return for an email. If you know exactly where your customer hangs out online (ie. enthusiast groups, magazine readers, forums), then Facebook is an easy choice. If you product is time sensitive and solves a rare problem, then Google will often be better than Facebook. Regardless of the questions above, you need to have a strong value proposition! Without one, you will never be profitable. Great article! I’m comfortably experienced in most aspects of Ecommerce, but not so much in digital ads. I’m always looking for quick bits of knowledge that are easy to remember when needed on the spot and this was perfect! Easy to consume and will definitely be easy to remember/reference once I’m ready to start testing ads. Thank you! Excellent promo video Steve. Looks perfect for the Facebook audience. I am sure you will bring in a ton of leads and sales. My take-away from this is that I stink at marketing :-). These are some really great tips that never would have occurred to me. Thanks for the briefing on which direction to go based on what you are trying to do and who you are trying to reach! Hey Steve, you nailed it right on the head! Your article has opened my eyes and think differently when it comes to advertising ones product online, one thing I always like about your articles is the way you explain difficult things to be simple as ABC. As a web developer, I’m always thinking logically, but when it comes advertising online I believe emotions works better rather than logic. This is my understanding on this platform. If you like more number of likes then go for Facebook but if you want more number of clicks on your site then go for the Google AdWords. I had observed that in facebook, many of the visitors simply like the post because of beautiful image but they do not bother to go and check website.